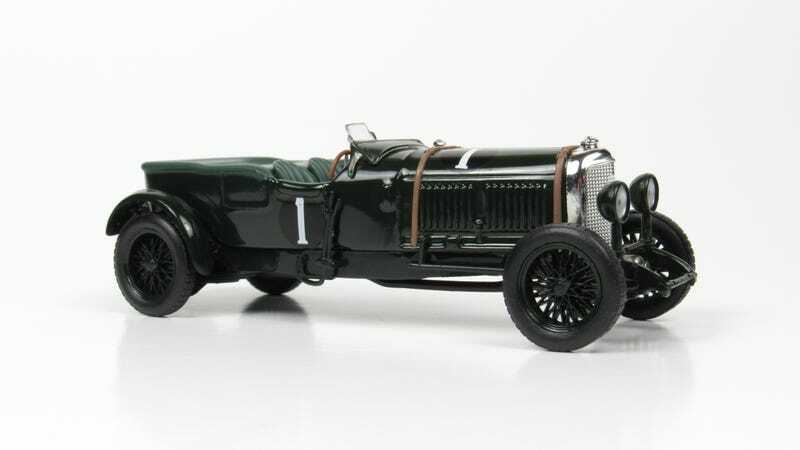 This is the 1929 and 1930 24 Hours of Le Mans winning Bentley Speed Six- affectionately nicknamed “Old Number One”- recreated by IXO in 1/43 scale. That’s right, this specific chassis won the race two years in a row, with substantial mechanical upgrades being performed between the two races to keep up with the competition. This model is the 1929 version which was number 1, whereas the 1930 version was #4. Bentley was very successful in Le Mans’ pre-war era, with factory teams taking home victories in 1924, 1927, 1928, 1929, and 1930. However, a Bentley factory team did not return to Le Mans in 1931 and it would be another 70 years before the company entered another factory team in the race. Woolf Barnato drove this car to both its victories, with Henry Birkin joining him in 1929 and Glen Kidston in 1930. Yep, back in those days teams consisted of only 2 drivers. In 1929, this car finished 7 laps ahead of second place and travelled almost 1,800 miles over the 24 hours. IXO has faithfully captured the essence of pre-war motoring with this replica. The straps, exposed components, open wheels....I could keep going. While the quality and level of detail are not top tier, they nailed the “feel” of the car perfectly.